Samsung is no stranger to great design, especially not in recent years. Its flagship smartphones are some of the best out there, in terms of both looks and performance, but Samsung doesn't just offer great design at the top tier. It also brings great design and performance to the mid-range. Samsung's Galaxy A range of devices have always been an interesting bunch and the A9 is the most exciting yet. Like the Galaxy S and Galaxy Note series, and other flagship smartphones, the Galaxy A9 has a glass back. The 3D glass doesn't feel quite as premium in the hand as the more expensive handsets in Samsung's portfolio but the colour options available for the A9 are lovely. It comes in three colours comprising Bubblegum Pink, Lemonade Blue and Caviar Black but it's the pink and blue options you'll want. They both have a striking ombre effect finish - a little like the Huawei P20 Pro's Twilight option - and they look amazing. Or at the very least different, which is a novelty for smartphones these days. The rear of the A9 has a slight curve to its edges and there is a square fingerprint sensor in the middle - probably the feature that gives the A9 away as a mid-ranger. There is also a four-lens vertically-aligned camera system in the top left - more on that in a minute. On the front, the screen features a small bezel at the top and the bottom, though not as slim as the S9 and S9+. The edges are also flat rather than curved so the A9 isn't as striking from the front as the Infinity Display on the Galaxy S and Note devices. The Galaxy A9 comes with USB Type-C, unlike the cheaper Galaxy A7 that comes with Micro-USB and it is presumed it is water and dust resistant, though Samsung hasn't specified. There is also a dedicated Bixby button on the left edge, like the S9, S9+ and Note 9 devices and the USB Type-C port is flanked with a speaker on one side and a 3.5mm headphone jack on the other. The Samsung Galaxy A9 has a 6.3-inch Super AMOLED display, putting it between the Galaxy S9+ and the Galaxy Note 9 in terms of screen size. Like the flagship devices, the A9 has a Super AMOLED screen which theoretically should offer punchy and vibrant colours and deep blacks but we will compare it to the Galaxy S and Note devices when we review the A9 in full. First impressions are good though. Along with flat edges rather than curved, the A9 also has a Full HD+ resolution, 2220 x 1080 pixels, rather than Quad HD+ like the S9 and S9+. This results in a pixel density of 392ppi, making it softer than the company's flagship smartphones, as you would expect from a mid-range device. There is also no mobile HDR support on the A9. In terms of aspect ratio, the A9 opts for 18:9, rather than 18.5:9 like the S9 and S9+, which is a result of the slightly larger bezels. This 18:9 aspect still allows for plenty of screen within the footprint though, meaning the A9 is a manageable device despite that large display. The ombre effect finish is certainly a highlight of the Samsung Galaxy A9 but it's the rear camera setup that is likely to be the main talking point of this device. Samsung has said the A9 was built for the Instagram generation, offering four camera lenses on the back and one 24-megapixels with an f/2.0 aperture on the front. The four lenses on the rear are comprised of a main 24-megapixel f/1.7 sensor, a secondary 5-megapixel depth sensor for bokeh effects or Live Focus as Samsung calls it, a third super-wide 8-megapixel sensor and a fourth 10-megapixel telephoto sensor. The super wide-angle sensor has a 120-degree field of view, which Samsung has said is the same as what you would see with the human eye. The A9 features a number of camera features from the Note 9 too, including the Scene Optimiser function that automatically determines over 20 scenes and optimises the settings to deliver the best shot possible. We couldn't test the camera performance during our short amount of time with the A9 but we will do so when we review it in full. 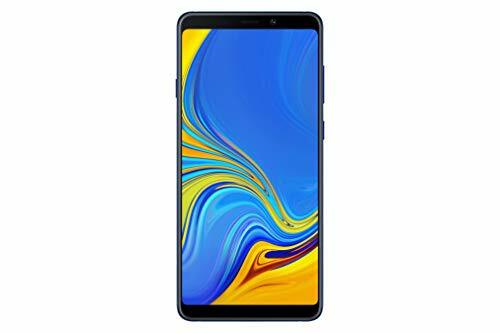 The Samsung Galaxy A9 runs on the Qualcomm Snapdragon 660 chipset, coupled with 6GB of RAM, which should mean it is more than capable when it comes to performance. By comparison, this is the same processor as the BlackBerry Key2. It might not be the latest chipset, or the most advanced, but the A9 is a mid-range device and it still offers 6GB of RAM, which should make it comfortable with everyday tasks. Under the hood there is 128GB of storage and there is microSD support for storage expansion up to 512GB, like the Galaxy Note 9. The Galaxy A9 also offers a huge 3800mAh battery, which is again between the S9+ and the Note 9. We'll be testing the A9's battery capacity when we get it in for review so hopefully it is up there with the great performance of the Note 9. It doesn't offer wireless charging though so that's something to note if you're considering this device. The Samsung Galaxy A9 runs on Android 8.0 Oreo with Samsung's UX Experience software over the top. Samsung has stripped back its software skin over the years, but it is still very much a Samsung experience, with Samsung-specific apps pre-installed for the camera, calendar, gallery and SMS. Overall, the A9 offers a very similar experience to Samsung's other devices with many of the same features including Bixby Voice. The Galaxy A7 has Bixby but not Bixby Voice so the A9 is the only one of Samsung's mid-range and budget handsets to offer the assistant. The A9 misses out on a couple of flagship features, like iris scanning, offering only Face Unlock instead, but on the whole, the A9 delivers a comprehensive software experience as you would expect from a Samsung device. There are some great hardware specifications under the hood of the A9 too, including 6GB of RAM, microSD support, a 3.5mm headphone jack and a huge 3800mAh battery. There's also a 24-megapixel front camera for all those selfies and a huge screen on board within a manageable footprint. The biggest obstacle the Samsung A9's faces is its price. At £549, it's significantly cheaper than the likes of the S9 and S9+, but it's quite a bit more expensive than devices like the OnePlus 6. The Samsung name carries a lot of weight though and for those after a Samsung device with a great design and some great features, the A9 certainly appears to be well worth considering based on what we have seen so far.